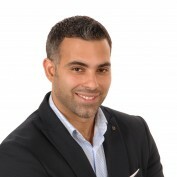 Bernard Safatli is a recognized Motivational Speaker, Certified Trainer of Neuro Linguistic Programming, Certified Trainer of Hypnotherapy, Life Coach and Business Strategist Based in Dubai. Bernard has risen to be one of the leading authorities on applying Neuro Linguistic Programming in Sales, Marketing, Communication and Leadership Performance excellence within this region. Drawing upon over 17 years of Sales, Leadership, NLP Training, and Executive Coaching experience Bernard is considered the “Ultimate Behavior and Performance Engineer” where his passion lies within the psychology of what makes people successful, creating successful strategies, and consistently delivering peak performance Teams. Bernard has created many success stories with the work he has done with Small, Medium and fortune 500 companies within the region. Through his expertise, Bernard brings clarity and understanding to many issues that business owners and organizations have to deal with. Whether it is understanding your client’s needs, creating the ultimate sales funnel, or establishing yourself as an expert within your field each facility is designed to educate and inspire people to succeed.